The National Rifle Association will unveil a new concealed-carry training program along with a new concealed-carry insurance plan during the group's annual meeting this week. The new programs, collectively called NRA Carry Guard, will feature advanced training aimed at the more than 14 million Americans who are legally permitted to carry concealed firearms across the country. In addition to the new training program, the NRA will launch a concealed-carry insurance program aimed at the same group of people. "Of our 5 million members, a lot of those folks carry and they have been clamoring for the NRA to provide an elite product with respect to training, insurance, and education," NRA spokesperson Bill Powers told the Washington Free Beacon. "The NRA has responded to our members and to the demand of the consumers, gun carrying consumers, that really wanted a first-rate elite program. NRA Carry Guard is an elite training, insurance, and education program. It is the finest in the world. For any citizen who gets up and puts a gun on their hip, Carry Guard is for them." Both the training and insurance will feature tiered offerings. The concealed-carry training classes will come in addition to the courses the NRA, the largest gun-training institution in America, already offers across the country. The classes will be specialized for concealed carry, take place over the course of days instead of hours, and involve more rigorous standards for certification. "It's going to be much more involved, much more intense," Powers said. "It was created from the ground up by a team of veteran SEALS, veteran Green Berets, veteran law enforcement experts, and it is very intense. People who have gone through the program are saying it's the best they've ever seen. "It's a whole different ballgame. It's a whole different level of training." 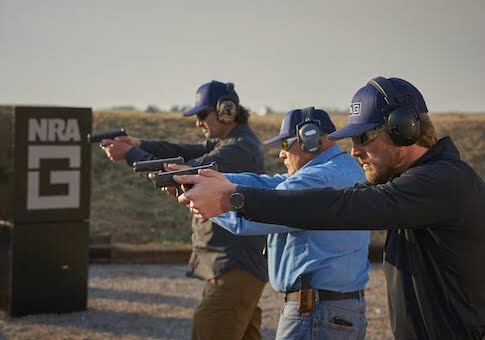 The NRA has lined up endorsements of the program from leading gun trainers such as Larry Vickers, Dom Raso, Joe Collins, and others. The new courses will extend beyond the basics of safely handling a firearm and dive into the advanced details of actually carrying one on your person in public. It will deal with the tactics of self-defense shooting, the mindset of a concealed carrier, the relevant laws, and more. The exact details of cost, training locations, and when the program will be available to consumers are still being worked out. But all current NRA-certified instructors, law enforcement officers, and military personnel are eligible to apply to become Carry Guard instructors. The group is planning to release more details on the new training programs during the annual meeting. The concealed-carry insurance plan the NRA will offer under Carry Guard will come in bronze, silver, and gold memberships. Each will offer a level of financial protection, as a reimbursement once charges have been dropped or the policy holder is found not guilty, in the case of criminal or civil action as the result of a self-defense shooting. It will also cover some costs associated with bail, a retainer for a lawyer, firearm replacement, pay lost during court dates, psychological support, and cleanup costs. The plan also includes access to a 24-hour hotline for incident reporting, free coverage for the policy holder's spouse, and a subscription to a new publication called NRA Carry Guard Magazine. The bronze membership will cost $13.95 a month and cover up to $250,000 in civil suit protection and $50,000 in criminal defense reimbursement. The silver membership will cost $21.95 a month and cover $500,000 in civil suit costs and $100,000 in criminal defense reimbursement. The gold membership will cost $31.95 a month and cover $1,000,000 in civil suit costs and $150,000 in criminal defense reimbursement. The NRA Carry Guard insurance plan will be underwritten by Chubb Insurance, one of the world's largest property and casualty insurers. It is available immediately through the group's website. NRA Carry Guard will compete directly with offerings from other concealed-carry insurance companies, some of which offer less expensive options or provide money upfront in the event of criminal prosecutions instead of reimbursements. Programs from companies such as the United States Concealed Carry Association, which is currently in a dispute with the NRA over exhibiting at the NRA Annual Meeting, U.S. Law Shield, Second Call Defense, and others have become more popular in recent years as concealed carry itself has grown in popularity. The NRA said their new training program and insurance policy are superior to offerings from competitors, in part, because of its history and continued prominence in promoting concealed carry nationwide. "Carry Guard really is another major extension in the NRA's efforts with respect to the concealed-carry movement," Powers said. "We worked that hard starting in the '80s and turned that into a national movement. And, in response to that, or as a result of that, there is a serious demand that we have felt from Americans who want this kind of top-level training and insurance program and, so, we're proud to offer it to them." The NRA will have representatives at its annual meeting later this week tasked with pitching Carry Guard to attendees. This entry was posted in Issues and tagged 2nd Amendment, Guns, NRA. Bookmark the permalink.